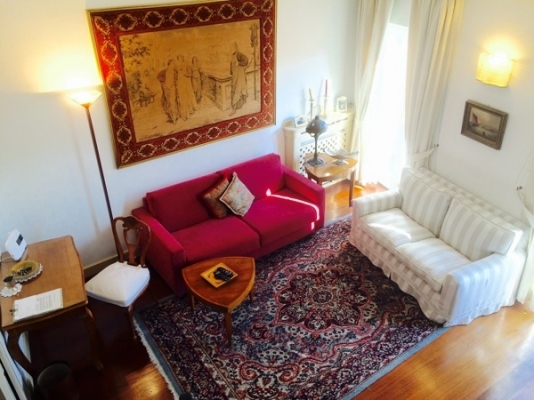 Central location in elegant neighborhood, 3 minutes walk from the Spanish Steps. All of historic Rome is within walking distance. Independent heating, tv/vcr, dvd player, stereo, satellite, a/c, parquet, wm, internet connection, elevator, terrace.Monthly possible.Discount for two weeks or more.Cleaning and change of linens and towels included once a week for rentals of 2 weeks. Great apartment in great location. Recommended. We had lovely time in Rome. It was our son's first visit. Despite all our excitement, the flat was so comfortable and quiet that we slept right through till 10 am on our first morning. We much appreciated Elie's welcome and the thoughtful fruit, guides, internet access, and everything. My wife and I had a delightful time in Rome this past October and particularly enjoyed staying in the wonderful apartment on the Via Sant'Andrea delle Fratte. I am writing to inquire whether the apartment is available next year. A big thank you for property #142 in Rome,it was beautiful.Thank you for your help. The apartment in via St Andrea Delle Fratte was excellent.Very central location, quiet, beautiful roof-terrace and suitable for children. We had a great time. Thank you very much!